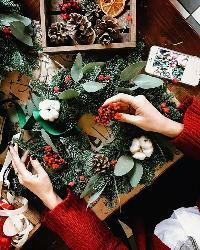 Prize: Up for grabs: $50 Starbucks Gift Card, $50 Anthropologie Gift Card, 2 Faux Fur Stockings, 2 Holiday Wreaths, 3 Cans of Williams Sonoma Hot Chocolate, 4 Vintage Inspired Ornaments. Two winners. Statistics: This contest was opened by 207 and entered by 26 ContestChest.com members. 13% of those who opened the contest, entered it.